Every once in a while we need to allow our bodies to break away from the vicious clutches of our stressful lifestyles and do something a little nurturing for ourselves. After the onslaught of Christmas, a busy start to the year with work plus the totally depressing weather which reduced me to being a total hermit for 2 months, I was definitely in need of a spring clean - both mentally and physically - and to get a renewed appreciation of the outdoors before I went completely barking.After considering the burgeoning number of small, upmarket wellness retreats I opted for one in the UK - the thought of having to fly somewhere was too stressful! So, for five full days I gave myself over completely to the nurturing hands of the team at Yeotown; now this is not the type of boot camp place where you’re frog marched around, left to survive on liquids and end up looking more miserable then when you arrived. It’s a luxurious rural base in the beautiful Devon countryside where you leave your day to day routine behind (phone reception is poor and outside distractions are not encouraged) and have time to focus wholly and completely on yourself. To really benefit from your time at Yeotown, you do need to ease yourself into the detox by following the pre-retreat guidelines: no meat, no diary, no wheat, no alcohol and definitely no caffeine. The 2 weeks leading up to my five day retreat were hard but, the Hubby joined me for support (on a pared down detox) and it definitely made the five days easier. The whole setting at Yeotown is just gorgeous and so relaxing - you’re made to feel at home as soon as you arrive and can treat the lounges and kitchen as your own. My room was beautiful with a huge bed and sumptuous bathroom with enormous shower oodles of gorgeous organic toiletries and blissful under floor heating, which I could keep on and not have the Hubby nagging me to turn it off! Each day we woke early and our excellent yoga instructor (one of the founders of Yeotown, Mercedes Ngoh) eased us into the day with Vinyassa Flow yoga. 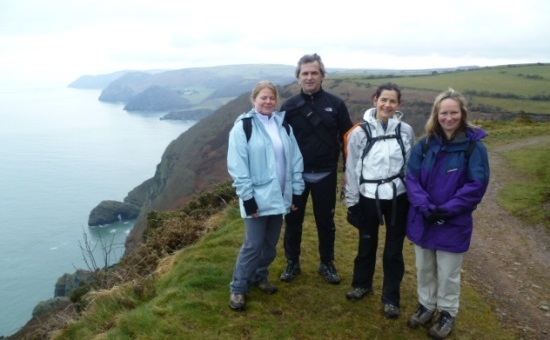 After breakfast we undertook some bracing and speedy hikes along moorlands and stunning coastal paths which reminded me how wonderful the English countryside is….even in strong winds and rain. Davy (our guide on all our hikes) certainly kept the pace going with his army background! The afternoon was filled with other activities and before dinner Mercedes took us under her wing again for some relaxing yoga followed by some of the best massage I’ve had and informative talks to help make adjustments to your life at home. Two things that stick in my mind about the five days was how friendly everyone was, both staff and guests (the maximum number of guests in 10) how amazing and nutritious vegan detox food can be, truly! The Chef, Julia, is a wonder and yes, I had to get used to eating smaller quantities but, you were never left hungry (with regular snacks and Yeotinis to keep your blood sugar levels constant) and you definitely looked forward to your meals; I loved the fact that Julia would always chat about her recipes so you could get some insider knowledge. Each guest arrived with their own motives and goals. Mine was to feel better in myself, find some balance in my life and to prove that I had the self-discipline to do a 3 week detox. I certainly achieved these and more - I left feeling brighter, refreshed and definitely calmer, with lots of great ways to tweak my life for the better including getting back my love for yoga. What I loved at Yeotown was the whole holistic approach: strong in body, clear in mind and balance in being. Yeotown offers 5 day detox retreats as well as shorter Weekend Warrior packages (www.yeotown.com). If you’d like more information about what to expect on the retreat or ideas on other retreats (maybe in warmer climes! ), then please get in touch.